People sometimes go to barmy lenghts to conceal the tact that they've pinched an Idea for a game. This one or instance, is supposedly all about stranded astronauts searching tor fuel tor their spaceship. Pah! I know a rip-off of Magic Knight when I see one! In truth, gentle reader, Metropolis^ naught but a spacified version of David Jones excellent trilogy for Mastertronlc. Here, the put-upon hero. Moonboots, wears a spacesuit instead of armour, and is attacked by aliens instead of demons, but the idea's the same; make your way through dozens of chambers. avoiding attack and searching out the objects which will open locked doors and help you return to your home. The Backgrounds aren't bad, though there's precious little explanation of what chandeliers, suits of armour and Gothic pillars are doing in an alien metropolis. What lets the game down are the sprites; single coloured and very poorly designed, they don't dome near the standard you'd expect, even from a budget game. At some stages the white astronaut disappears in front of the white background details. The sound effects stink too; apart from an irritating BOINK BOINK from some of fhe bouncing aliens, here's precious little in the way of aural excitement. Fortunately, the gameplay isn't that bad. Above the playing area is your "Pyramid of Strength", which decreases on each contact with an alien. To the right is your inventory, which never stretches beyond two objects. Each time you find a new object - an oil-can, hammer, key or whatever - it is automatically added to your inventory, and the last object dropped. By juggling objects in this way you should be able to (ind which will open the locked doors which bar your way. Each time you lose a life you turn into a (lying jelly (I didn't quite understand that bit) and at the end ot the game you're told what percentage ot the adventure you've completed. An amiable little game. then, probably entertaining for a good few hours but let down by some sloppy graphics and sound design. Well, you'll be pleased to know that Powerhouse plans to release Magic Knight... oops, sorry, that was a most unfortunate slip of the typewriter. 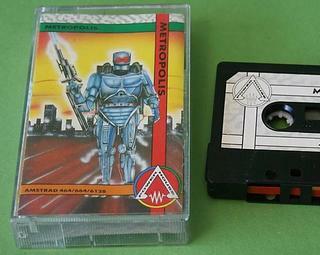 Powerhouse will also be releasing Metropolis for the Amsfrad. That's better. Or rather we hope It will be.